In the Pit Cell, you can find a save point and a moogle. Nevertheless, your goal is to escape. Attack the door to obtain clusters. Once the cluster gauge is filled, use a reaction command to break out. Tron will then join as an optional party member, though he doesn't have his limit yet. Open the two chests for a Pit Cell Area Map and a Myhtril Crystal, then exit to the Canyon. Open the first chest nearby for a Frost Crystal. Head up the ramp and open the chest in the corner for a Mythril Stone. Continue up the next ramp and open the chest at the top for a Dark Crystal to the right and a Mythril Gem to the left. Drop down to the center and examine the machine to activate a mini-game in which you must find the box that glows red and attack it. Clear the mini-game to turn the power on, then return to the Pit Cell, access the computer, and return to Hollow Bastion's Research Lab. Use the charge to ram large groups of Heartless into the wall. 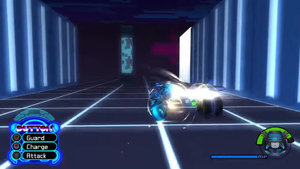 Upon returning to the world, Sora will be thrust right into the mini-game of Light Cycle. You can use to move the bike along the grid left or right, and and to turn right or left when prompted. The Heartless participating will play dirty in the race, attempting to attack Sora by hitting him or even charging into him. Each action has a different function to combat the troublesome racers: is a Keyblade attack that breaks enemy charges, is a charge that breaks enemy guards and launches them into the wall, and is a guard that breaks enemy attacks from the left and right. The most useful of these actions is the charge, as it can harm both enemies that are attacking or guarding. The first round consists of only a few Heartless, but the second will begin when a Devastator hops onto the track and will go on for much longer. 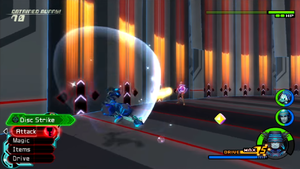 Dodge all Heartless and best all obstacles to reach the end of the course, then use a guard when the multiple Devastators attack to escape safely. After the scene, Tron will rejoin the party. Head to the Canyon. Defeat the newly-spawned Heartless as you move up the ramp, then take the right exit to the Dataspace. Access the computer at the end of the room to begin a timed battle. Rather than dropping the usual health or munny, the Heartless here will drop clusters. Fill the gauge with clusters to perform the Freeze reaction command on one of the monitors, then continue on to the next. Ignore the Heartless once the gauge is full and skip to performing the reaction command, since you're under time constraints. Clearing the task will earn Sora, Goofy, and Tron increases in maximum HP, and Thunder Boost for Donald. Exit the room after the scene and head straight to the lift. Open the two chests for an AP Boost and a Power Crystal. Head right into the I/O Tower Communications Room and open the chests after the scene for a Gaia Belt and an I/O Tower Map. Return to the Hallway once ready for a boss fight. Use Drive Forms and Tron's limit to keep the assault up so that the Hostile Program drops clusters. Like the many other tasks of this world, this battle will have you picking up clusters. Attack the enemy with Drives (such as Limit Form's Ars Arcanum or the newly-acquired Master Form) and Tron's limit in order for it to drop enough clusters to fill the gauge. 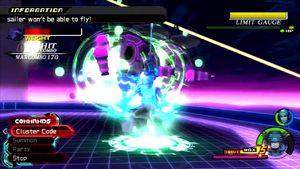 Use the reaction command to freeze it, allowing you to perform some combos while it remains stationary. It will eventually wake up and drop some clusters as it does, so make sure to collect them before it returns on the offensive. The Hostile Program has a couple of attacks to look out for, but nothing too tough. From time to time, it will shoot bullets that move at a robotic pace, giving Sora an ample amount of time to dodge and even attack. Another attack has it charge at a rapid pace around the room, though it will stick close to the wall as always. It also has the ability to shoot lasers from its arms, though because its arms are separate from the body, Sora can dodge through them and continue to attack the body of the Hostile Program. Overall, while this battle's gimmick may make it stretch in length, it should be completed without much trouble. Doing so will power up Sora's drive gauge as well as earn him a new ability that lets him attack all surrounding enemies, Vicinity Break. Donald and Tron obtain a boost in maximum HP while Goofy obtains Jackpot. 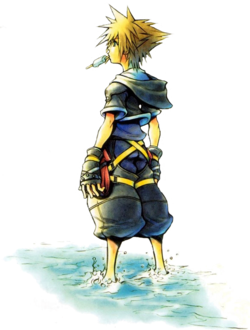 After leaving the world, Sora will obtain the Photon Debugger Keyblade, and the party will end up back in Hollow Bastion. Use Tron's limit to breeze through the otherwise tough Solar Sailor Simulation. From the Hollow Bastion Research Lab, transport yourself to the Pit Cell. From there, access the computer and select Light Cycle. Defeat the Heartless to have Tron join the party, then exit to the Canyon and from there, to the I/O Tower. Defeat all Heartless in your path to gain entrance to the Communications Room, then return to the Hallway and go through to the Simulation Hanger. At the end of the path (by the machine) is a warp to the Solar Sailor Simulation. Use a reaction command at the top of the Solar Sailor to depart. This will begin a battle in which you must defeat enemies quickly enough so that the constant waves of them do not weigh down the sailor. Use Tron's limit and Master Form if necessary to clear this, particularly when the Devastators make an appearance. 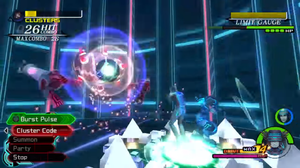 Clearing the simulation will net the incredibly useful Explosion combo finisher for Sora, another useful ability for Donald in the form of MP Hastera, and increases in the maximum HP of Goofy and Tron. Upon touching down in the Central Computer Mesa, pick up the AP Boost, Orichalcum+, Central Computer Core Map, and Cosmic Arts. Head down the path ahead to face the world's final bosses. The only attack Sark uses can be combated with a reaction command combo. You will first be thrown into a battle with Sark, though this shouldn't give you much trouble as he is easily caught in combos. When he throws his disc, make sure to perform the Zone Guard/Disc Strike reaction command combo to throw it right back at him and stun him. After attacking him for a bit, Sark will warp only to perform the exact same attack. His defeat will lead right into the next battle, in which Sark is enlarged by the MCP in order to protect him. The MCP can only be attacked by use of the Delete/Charge reaction command combo. Attack the giant Sark's legs and he will kneel down, dropping his head and leaving it open to attack. Drain his HP to leave him stunned for a good while, in which case you can focus your attention on the MCP. Attack one of the panels surrounding it for the ability to perform the Delete/Charge reaction command combo. If you have the Explosion ability equipped, it will come in handy for this part of the battle, as it can destroy numerous panels at once. However, Delete/Charge not only requires a free space, but it has two other criteria: Tron must be alive and nearby. Performing Delete will bring you right into charge, where every press of will be a hit landed on the MCP. Uniquely, this is the only way the MCP can be attacked, as it cannot be reached by any combos or even magic. Eventually, the MCP will halt the attack with blasts of energy directed at the party, leaving Sora to knock out Sark and take out a panel again. When the MCP's health gets low enough, Sark will perform a new attack in which he traps the party with a wall. Ironically, this only makes him easier to knock out, as performing a reaction command by the wall will instantly take out all of his health. 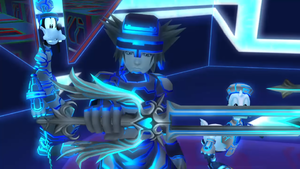 Defeat the MCP for an upgrade in Sora's Reflect magic (which should prove useful for some final battles) as well as an increase in maximum HP, an extra accessory slot for Goofy, and increased HP for Donald and Tron. For clearing the world, Hollow Bastion will become the place of light that it once was long ago: Radiant Garden. You can continue to the optional (but recommended) 100 Acre Wood and Atlantica if you haven't cleared them already, or head to Twilight Town for the beginning of the end. This page was last edited on 29 September 2017, at 04:08.